The A.G.M. is held once a year (surprisingly), the venue of which can alter, subject to the availability of a suitable room at one of the amateur radio rallies. The past year, both in the way of administration and activity is discussed. Presentations are made for the higher levels of W.A.B. Awards and to Contest winners. 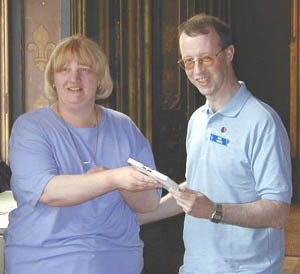 Seen here is Mike, M(D)0BJM receiving such an Award from Sue, G0NLX, the then President. Also presented are Awards such as the Founder’s Trophy, which is given for a major contribution to W.A.B., other than on the air activity. 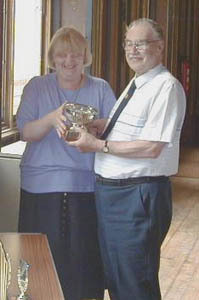 Seen here is Brian, G4KSQ receiving this trophy in acknowledgement of the years he spent as Membership Secretary. Bound Skerries Trophy – in recognition of outstanding mobile or portable activity during the previous year. Net Controller’s Award – in recognition of those who have spent hours keeping the nets in order. At the meeting, the Committee and President are elected by the general membership for the forthcoming year. Seen here is Norman, G1NTW, having just received the Presidential chain of office to mark his year as President. The meeting gives a chance for members to meet each other, perhaps for the first time to put a face to the voice. It also enables the Committee to get a direct feed back from the membership and also gain, we hope, positive suggestions for the future of W.A.B. Images from the 1983 A.G.M. Images from the 2002 A.G.M. Images from the 2003 A.G.M. Images from the 2004 A.G.M. Images from the 2005 A.G.M. 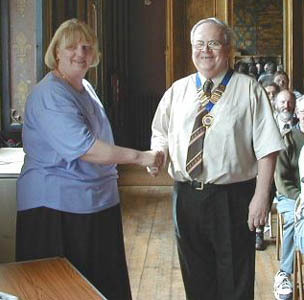 Images from the 2007 A.G.M. Images from the 2008 A.G.M. Images from the 2009 A.G.M. Images from the 2013 A.G.M. Images from the 2014 A.G.M. Images from the 2015 A.G.M. Images from the 2016 A.G.M.